People may bemoan Ghana’s often poor performances in Africa Cup of Nations tournaments but a big reason they usually get to the semi-finals, at least, is because of a winning mentality. 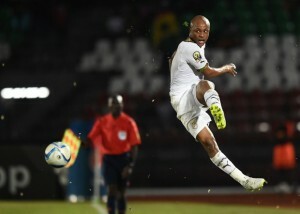 A player who epitomises this is the goal-scorer who headed in the winner, Andre Ayew. He didn’t play as well as he could but he continually got himself into positions to score and eventually headed in the goal. Ghana looked like they would be reliant on set pieces and Ayew was able to draw smart fouls when they were in search of a winner and also when hanging onto the lead. South Africa on the other hand are a team mostly filled with South African Premier League players who aren’t used to the pressure and don’t give you the impression they are going to grind out a win. The Bafana Bafana went ahead in every match and still finished bottom of the group. You can hardly expect to advance to the next stage in such a manner. They failed to capitalise on chances created in their first two matches and in their final group game they conceded possession and territory immediately after opening the scoring. It’s difficult to change your mentality into an attacking one, after defending for so long. The interesting thing is that they never looked like hanging on and you have to question Shakes Mashaba’s game management. They couldn’t take the sting out of the match at all and only seem to be able to play in two modes, all-out attack or bunkering defence. Senegal coach Alain Giresse opted for the 3-5-2 system which his side looked uncomfortable with in the opening half of their contest versus Ghana. While it gave them more numbers in defence, Riyad Mahrez’s opener came as a direct result of Stephane Badji losing his man. It is difficult to approach fixtures where all you need is a draw to go through, but, initially at least, Giresse should have been more adventurous rather than risk-averse. In the end, after conceding the early goal, they were always chasing the game – in terms of having to rejig the system and having to breakdown an Algerian side which, as we saw at the World Cup, is resilient. Bar a long range effort or a moment of brilliance from the usually lively Sadio Mane, it was hard to see where the creativity would come from in this Senegal team. While central creativity is a widespread problem in this tournament, the Teranga Lions were often too narrow and only Mane and Mame Biram Diouf individually caused any sort of problems for the Algerians. As Algeria retreated later on and Mane was brought off, this weakness became even more apparent as Senegal resorted to pumping balls into the box which Algeria had little trouble in dealing wth. Les Fennecs were not at their vintage best, but in the first 20 minutes of the first half they played their best football in the tournament yet. There was the heavy influence of Yacine Brahimi, the directness of Riyad Mahrez, and good energy supplied by Nabil Bentaleb and Saphir Taider. At the back, Madjid Bougherra has been faultless since coming in for the injured Rafik Halliche and the rest of his defence did their job solidly to cope with Senegal’s aerial and physical onslaught. Not at their best, then, but who’s to say the best isn’t yet to come? They negotiated their way out of a difficult fixture and remain alive.